Honestly, it has been a while since I have read the book, so all 3 are kind of melding together for me. I will give you the jist of what I can remember of the first book. To start off with, I had owned this book for more then 2 years before I even picked it up. But lately that has become usual for me. Going into this book I thought it would take place in a creepy Wonderland. But it just takes place in Georgia. Or Alabama. I can’t remember which. In the first few pages I already knew that Ali was going to be a little annoying. I mean, yeah sure. She had just caused the death of her entire family and that can be pretty traumatizing. But come on. 4ish months of nothing but sitting in your bedroom at your grandparents house. Not even bothering to venture out. She was kinda rude to her grandparents too because they just lost their daughter, son in law and youngest granddaughter. During the time she spent in the hospital. Virtually uninjured from a car crash that killed her entire family. Slashed her mothers thigh open and her sisters cheek. Yes. That is logical. She has no major injuries. Anyways. So in the hospital she meets Kat, this girl that is “there because her mom is a nurse.” And she is…a teenage girl. That’s for sure. She speaks like she had a bad batch of some kind of drug. So before class even starts she is being swept away by Kat and her other friends that basically are there to fill the void of not having more people to talk to. Once upon a time characters had a point. Not anymore I guess. Sometime during that day we run into Cole…and upon seeing each other Ali has a vision of them seriously making out. Well. We still think she’s having some freaky day dream. Whatever. Creepy. Also apparently Kat’s on-again off-again boyfriend is friends with this dude too. Oh. I am forgetting something important. Ali and her dad, and we later find out this group of freaky teenagers, can see these zombie ghost things. That turn out to be corrupted souls or something like that. I can’t really remember. They eat your soul. And their bites can turn you into something like them too. From now on I am going to give you even more of a jist, now that you got the basic character set up. At some point Ali starts seeing rabbit clouds in the sky. And then she starts seeing her sister and Emma starts talking to her. Warning her about something coming. We later find out that the rabbit clouds are Emma warning Ali when there will be a “zombie” attack. Which is pretty helpful because it gives her, and the freak teenagers, time to prep for the attack and make sure the loved ones are safe. Or as safe as they can be from things they can’t even see. There is a lot of useless fighting and story progression that isn’t really progression. I swear by the time Ali starts to figure things out the book is done. I guess that’s why there are two sequels. The ending is a little blurry for me. But don’t fret. I shall do the next two books soon. Oh. P.S. THERE IS NOTHING ABOUT FREAKING WONDERLAND IN THIS BOOK SERIES BESIDE RABBIT CLOUDS AND HER NAME BEING ALICE. THAT’S IT. SERIOUSLY. If you want a book about a creepy Wonderland. Don’t read this one. 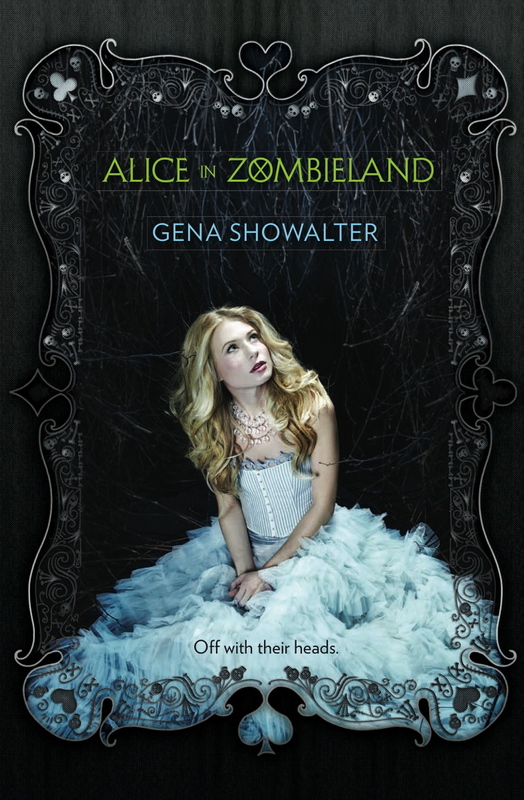 This entry was posted in Book Review and tagged alice in zombieland, book, book review, book reviewer, books, fake zombie, gena showalter, zombie, zombies. Bookmark the permalink. I read this book a while ago and I thought the same thing. It really reminds me of Twilight and not in a good way. I was severely disappointed that this book didn’t turn out the way it could have.